Experience wagertool®, and you'll find innovation on every level. Introducing the world to an effective trading software, forever changing the way traders experience wages. With advanced search, configurable alert settings and more, you can do things that were impossible before. wagertool® learns with and from you, adapting itself to your wagering style, letting you do all kinds of essential things faster and simpler. We designed wagertool® to expand on the versatility of every user, and while the technology inside is unlike anything ever coded, using it for the first time feels instantly familiar. Discover your favorite market quickly. wagertool® keeps you up to date with thoughful personalized alerts. A completely new and re-imagined cash out menu. Take full advantage of any working display. Create your own options according to your needs. wagertool® comes with a variety of features that make it easy to take on the essential things you do. A simple search will quickly find your teams and markets. An easy way to find what you need in seconds. But in case you need a more accurate search, wagertool® lets you save time by allowing you to create convenient filtering and re-sorting options that let you focus on the most important information for you. wagertool® gives you absolutely the best powerful trading experience. 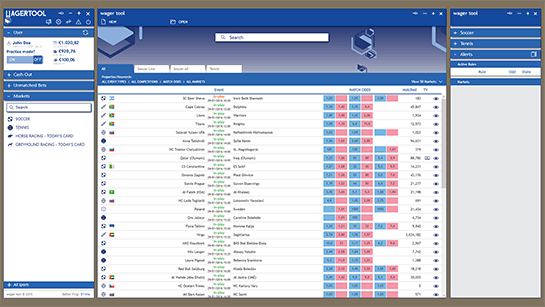 Designed to be the best trading tool on the market, wagertool® distinguishes itself with a clean, content-centric design and beautiful graphic layout that nicely balance with innovation. Advanced security and training mode system. wagertool® is the most intuitive, advanced and secure trading software in the world. It uses state-of-the-art security measures when handling your information. Your sensitive personal information is fully encrypted and securely stored. wagertool® is certified by Betfair - security tested and approved by Betfair. 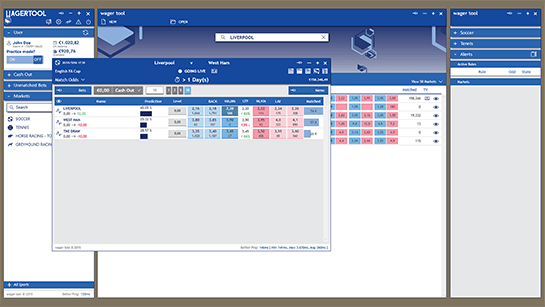 By removing common barriers for amateur traders wagertool® provides a fantastic on-board experience that lets people try out a practice mode that feels real in every way. Its innovative approach helps users gain confidence without placing money at risk. It's easy and secure! When trading, there may be moments when you want even greater precision. wagertool® is a revolutionary new and highly efficient way to build and submit your bets faster than ever before. 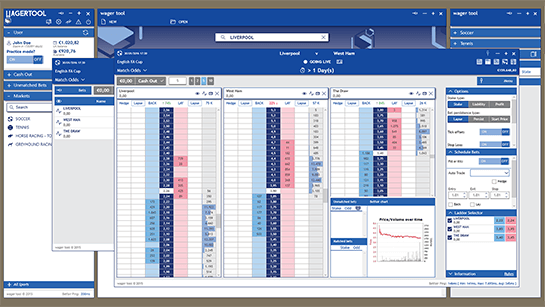 It offers increased trading speed and efficiency plus a new set of features designed to enhance the wagering experience, such as advanced charting, undockable and resizable windows, allowing you to create a customizable view of the market and personalized trading setup. It's easy to use and as you customize your interface, you'll experience faster trading. wagertool® for iOS and Android. wagertool® apps look and feel native because they are. They look and behave the way the end user expects. wagertool® has expanded to android tablets. If your trading takes you everywhere, use wagertool® and you’ll be able to get things done on the go. 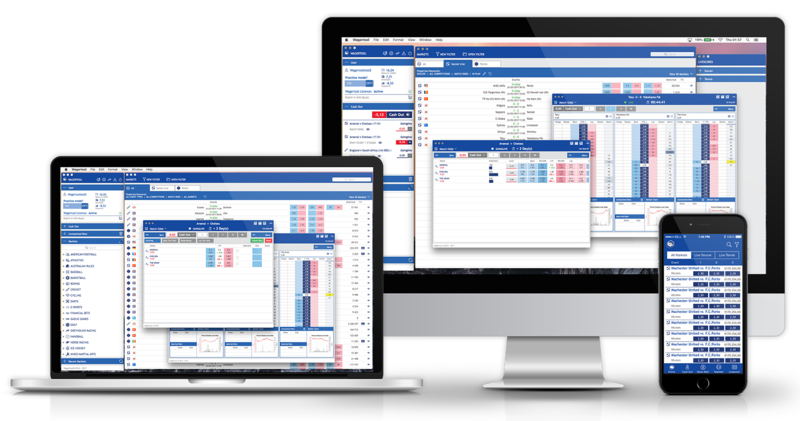 wagertool® brings the trading efficiency you love to the Mac. The experience has been meticulously crafted to optimize trader workflow. wagertool® is a native macOS application and follows the Apple Human Interface Guidelines. In other words, it looks and behaves the way Mac software is supposed to. Everything you need to get your trading off the ground. The wagertool® lifetime subscription is on sale for a limited time! Take this opportunity to get wagertool® with a 25% off discount. Only one 15 days trial license is allowed per Betfair username and you can try it on all platforms. However, installing wagertool® on a new platform does not reset the trial period. The software is great. I’m a trader in football, tennis, basket and manly in horse racing. I have used several softwares, but I’m testing wagertool now and I think it is incredible. I love the layout, the speed and many functionalities. Congratulations. Many congratulations, it looks excellent with only a few hours of use I already feel like I’m going to move from a competitor for wagertool. Thanks for the clear answers on my two previous questions. I would also like to congratulate you for the software, and tell you that besides fast, adjustable and friendly interface, it allows me to optimize my trades. The speed and clarity with which I understand the markets in the ladder view is amazing! Congrats for this awesome piece of software! It is user friendly and super-fast! Great! Hello, I would like to congratulate the excellent program, I'm really enjoying it. Very good the new version with the ESA API, congratulations on the upgrade!!! I tested it in my notebook using the shared internet from my phone, and it worked very well, it did not cut the entries neither the tick offset, very good.